This article is about politics in Canada and the United Kingdom. For other uses, see Tory (disambiguation). A Tory (/ˈtɔːri/) is a person who holds a political philosophy known as Toryism, based on a British version of traditionalism and conservatism, which upholds the supremacy of social order as it has evolved throughout history. The Tory ethos has been summed up with the phrase "God, King, and Country". 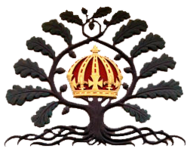 Tories generally advocate monarchism, and were historically of a high church Anglican religious heritage, opposed to the liberalism of the Whig faction. The word Tory derives from the Middle Irish word tóraidhe; modern Irish tóraí; modern Scottish Gaelic Tòraidh: outlaw, robber or brigand, from the Irish word tóir, meaning "pursuit", since outlaws were "pursued men". The term was initially applied in Ireland to the isolated bands of guerrillas resisting Oliver Cromwell's nine-month 1649–1650 campaign in Ireland, who were allied with Royalists through treaty with the Parliament of Confederate Ireland, signed at Kilkenny in January 1649; and later to dispossessed Catholics in Ulster following the Restoration. It was also used to refer to a Rapparee and later applied to Confederates or Cavaliers in arms. The term was thus originally a term of abuse, "an Irish rebel", before being adopted as a political label in the same way as "Whig". 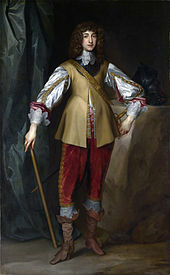 Towards the end of Charles II's reign (1660–1685) there was some debate about whether or not his brother, James, Duke of York, should be allowed to succeed to the throne. "Whigs", originally a reference to Scottish cattle-drovers (stereotypically radical anti-Catholic Covenanters), was the abusive term directed at those who wanted to exclude James on the grounds that he was a Roman Catholic. Those who were not prepared to exclude James were labelled "Abhorrers" and later "Tories". Titus Oates applied the term Tory, which then signified an Irish robber, to those who would not believe in his Popish Plot and the name gradually became extended to all who were supposed to have sympathy with the Catholic Duke of York. The suffix -ism was quickly added to both Whig and Tory to make Whiggism and Toryism, meaning the principles and methods of each faction. The term Tory was first used to designate the pre-Confederation British ruling classes of Upper Canada and Lower Canada, known as the Family Compact and the Château Clique, an elite within the governing classes and often members within a section of society known as the United Empire Loyalists. The United Empire Loyalists were American loyalists who resettled in British North America during or after the American Revolutionary War. In post-Confederation Canada, the terms "Red Tory" and "Blue Tory" have long been used to describe the two wings of the Conservative and previously the Progressive Conservative (PC) parties. The dyadic tensions originally arose out of the 1854 political union of British-Canadian Tories, French-Canadian traditionalists and the monarchist and loyalist leaning sections of the emerging commercial classes at the time—many of whom were uncomfortable with the pro-American and annexationist tendencies within the liberal Clear Grits. Tory strength and prominence in the political culture was a feature of life in Nova Scotia, New Brunswick, Prince Edward Island, Ontario and Manitoba. Throughout the course of Canadian history, the Conservative Party was generally controlled by MacDonaldian Tory elements, which in Canada meant an adherence to the English-Canadian traditions of Monarchy, Empire-Commonwealth, parliamentary government, nationalism, protectionism, social reform and eventually acceptance of the necessity of the welfare state. By the 1970s, the Progressive Conservative Party was a Keynesian-consensus party. With the onset of stagflation in the 1970s, some Canadian Tories came under the influence of neo-liberal developments in Great Britain and the United States, which highlighted the policies for privatization and supply-side interventions. In Canada, these tories have been labeled neoconservatives—which has a somewhat different connotation in the United States. By the early 1980s, there was no clear neoconservative in the Tory leadership cadre, but Brian Mulroney (who became leader in 1983) eventually came to adopt many policies from the Margaret Thatcher and Ronald Reagan governments. As Mulroney took the Progressive Conservative Party further in this direction, with policy initiatives in the areas of deregulation, privatization, free-trade and a consumption tax called the Goods and services tax (GST), many traditionally-minded Tories became concerned that a political and cultural schism was occurring within the party. The 1986 creation of the Reform Party of Canada attracted some of the neo-liberals and social conservatives away from the Tory party and as some of the neoconservative policies of the Mulroney government proved unpopular, some of the provincial-rights elements moved towards Reform as well. In 1993, Mulroney resigned rather than fight an election based on his record after almost nine years in power. This left the Progressive Conservatives in disarray and scrambling to understand how to make Toryism relevant in provinces such as Quebec, Saskatchewan, Alberta and British Columbia that had never had a strong tory tradition and political culture. Thereafter in the 1990s, the Progressive Conservatives were a small party in the House of Commons of Canada and could only exert legislative pressure on the government through their power in the Senate of Canada. Eventually, through death and retirements, this power waned. Joe Clark returned as leader, but the schism with the Reformers effectively watered down the combined Blue and Red Tory vote in Canada. By the late 1990s, there was talk of the necessity of uniting the right in Canada, to deter further Liberal majorities. Many tories—both red and blue—opposed such moves, while others took the view that all would have to be pragmatic if there was any hope of reviving a strong party system. The Canadian Alliance party (as the Reform Party had become) and some leading tories came together on an informal basis to see if they could find common ground. While Progressive Conservative Leader Joe Clark rebuffed the notion, the talks moved ahead and eventually in December 2003, the Canadian Alliance and the Progressive Conservative parties voted to rejoin into a new party called the Conservative Party of Canada. After the merger of the Progressive Conservatives with the Canadian Alliance in 2003, there was debate as to whether the "Tory" appellation should survive at the federal level. Although it was widely believed that some Alliance members would take offence to the term, it was officially accepted by the newly merged party during the 2004 leadership convention. 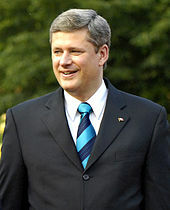 Stephen Harper, former leader of the Conservative Party of Canada and Prime Minister from 2006 to 2015, regularly refers to himself as a Tory and has suggested that the new party is a natural evolution of the conservative political movement in Canada. Dissident Red Tories who were against the merger went on to form the Progressive Canadian Party. The Tory political faction originally emerged within the Parliament of England to uphold the legitimist rights of James II to succeed his brother Charles II to the thrones of the three kingdoms. James became a Roman Catholic at a time when the state institutions were fiercely independent from the Roman Catholic Church—this was an issue for the Exclusion Crisis supporting Patricians, the political heirs to the nonconformist Roundheads and Covenanters. During the Exclusion Crisis, the word Tory was applied in Kingdom of England as a nickname to the opponents of the bill, called the Abhorrers. The word "Tory" had connotations of Papist and outlaw derived from its previous use in Ireland. There were two Tory ministries after James II came to the throne: the first led by the Earl of Rochester, the second by Lord Belasyse. A significant faction took part in the ousting of James II with the Whigs to defend the Church of England and definitive protestantism. A large but dwindling faction of Tories continued to support James in exile and his Stuart heirs to the throne, especially in 1714 after the accession of George I, the first Hanoverian monarch. Although only a minority of Tories gave their adhesion to the Jacobite risings, this was used by the Whigs to discredit the Tories and paint them as traitors. After the advent of the Prime Ministerial system under the Whig Robert Walpole, Lord Bute's premiership in the reign of George III marked a revival. Under the Corn Laws (1815–1846) a majority of Tories supported protectionist agrarianism with tariffs being imposed at the time for higher food prices, self-sufficiency and enhanced wages in rural employment. English Tories from the time of the Glorious Revolution up until the Reform Act 1832 were characterised by strong monarchist tendencies, support for the Church of England and hostility to radical reform, while the Tory party was an actual organisation which held power intermittently throughout the same period. Conservatism began to emerge in the late 18th century—it synthesised moderate Whig economic positions and many Tory social values to create a new political philosophy and faction in opposition to the French Revolution. Edmund Burke and William Pitt the Younger led the way in this. Interventionism and strong armed forces were to prove a hallmark of Toryism under subsequent Prime Ministers. As a predecessor party of the United Kingdom's Conservative and Unionist Party, its members, and the organization continue to be referred to as Tories. 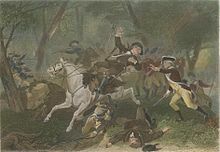 Depiction of the death of British Major Patrick Ferguson, during the American Revolutionary War. He was shot while commanding Loyalist regulars and militia at the Battle of Kings Mountain. The term Tory or "Loyalist" was used in the American Revolution for those who remained loyal to the British Crown. Since early in the 18th century, Tory had described those upholding the right of the King over Parliament. During the war of independence, particularly after the Declaration of Independence in 1776, this use was extended to cover anyone who remained loyal to the British Crown. 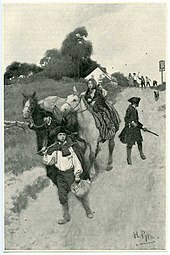 About 80% of the Loyalists remained in the United States after the war. The 60,000 or so Loyalists who settled in Nova Scotia, Quebec, the Bahamas, or returned to Great Britain after the American War of Independence are known as United Empire Loyalists. On February 12, 1798, Thomas Jefferson described the Federalist Party as "[a] political Sect [...] believing that the executive is the branch of our government which the most needs support, [who] are called federalists, sometimes aristocrats or monocrats, and sometimes Tories, after the corresponding sect in the English Government of exactly the same definition". However, that was clearly a hostile description by the Federalists' foes of whom Jefferson was one and not a name used by the Federalists themselves. In Texas in 1832–1836, support for the Texas Revolution was not unanimous. The "Tories" were men who supported the Mexican government. The Tories generally were long-term property holders whose roots were outside of the lower south. They typically had little interest in politics and sought conciliation rather than war or they withheld judgment from both sides. The Tories preferred to preserve the economic, political and social gains that they enjoyed as citizens of Mexico and the revolution threatened to jeopardize the security of their world. During the American Civil War, the term "Tory" was used to refer to Southern Unionists (White Southerners who stayed loyal to the Union) by the Confederates as a reference to the Loyalists of the American Revolution. Tory has become shorthand for a member of the Conservative Party or for the party in general in Canada and the UK. Some Conservatives call themselves Tories. The term is common in the media, but deprecated by some media channels. "Tory" in Canada typically refers to either a member of the Conservative Party of Canada, or the party as a whole. In addition to federal parties, the term Tory has been used in Canada to refer to members of provincial Conservative/Progressive Conservative parties, or the provincial organization as a whole. It is also used to refer to the Conservative Party's predecessor parties, including the Progressive Conservative Party of Canada. The term is used in contrast to "Grit", a shorthand for the Liberal Party of Canada. LGBTory is an advocacy group for LGBT supporters of the Conservative Party of Canada and provincial conservative parties. Members of LGBT+ Conservatives with a banner reading LGBTory. The group is the LGBT wing of the United Kingdom's Conservative Party. In the United Kingdom, the Conservative and Unionist Party, along with its members, are often referred to as "Tory" in the public, with the party frequently getting called the "Tories" by many media outlets. In Scotland, the term "Tory" is used predominantly in a derogatory way to describe members and supporters of the Conservative Party, or to accuse other parties of being insufficiently opposed to that party. For example, members and supporters of the Scottish Labour Party (especially those from the "Blairite" faction) may be referred to as "Red Tories" by traditional Labour members and advocates of an independent Scotland. Similarly, Labour supporters have referred to Scottish National Party members and supporters as being "Tartan Tories". The New Zealand National Party has been labelled Tories for many years, Some believe the name was brought to New Zealand by British immigrants who have likened the National party to the British Conservative party. In New Zealand using the term Tory to describe the National party has taken a derogatory meaning. [not in citation given] In Australia, "Tory" is occasionally used as a pejorative term by members of the Australian Labor Party to refer to conservative members of the Liberal Party of Australia and National Party of Australia parties (who are in a long-standing coalition). The term is not used anywhere near as often as in the UK and Canada, and it is rare – though not unheard of – for members of those parties to self-describe as "Tories". Chief Justice Garfield Barwick titled his memoir A Radical Tory. A moderate faction of the Australian Greens has been pejoratively dubbed the "Tree Tories" by the hard left faction. ^ Stuart Ball (2013). Portrait of a Party: The Conservative Party in Britain 1918–1945. Oxford U.P. p. 74. ^ William L. Sachs (2002). The Transformation of Anglicanism: From State Church to Global Communion. Cambridge University Press. p. 18. ^ John Charmley (2008). A history of conservative politics since 1830. Palgrave Macmillan. p. 103. ^ "Whigs and Tories". parliament.uk. Parliament of the United Kingdom. Retrieved 4 October 2018. ^ "Evil Oliver's legacy of enduring hate". Camden New Journal. New Journal Enterprises. 25 June 2009. ^ Oxford English Dictionary (Second Edition 1989) "1. a. In the 17th c., one of the dispossessed Irish, who became outlaws, subsisting by plundering and killing the English settlers and soldiers; a bog-trotter, a rapparee; later, often applied to any Irish Papist or Royalist in arms. Obs. exc. Hist." ^ Tomos Dafydd Davies, "'A tale of two Tories? ': the British and Canadian Conservative Parties and the'National Question'. The cases of Wales and Quebec." (2011). ^ Alex Marland, and Tom Flanagan. "Brand New Party: Political Branding and the Conservative Party of Canada." Canadian Journal of Political Science (2013) 46#4 pp: 951–972. ^ Laura Devaney, "The Unite the Right Movement and the Brokerage of Social Conservative Voices Within the New Conservative Party of Canada." The Agora 3.2 (2013): 101. ^ William Stewart Wallace, The United Empire Loyalists: A Chronicle of the Great Migration (1920) online. ^ Taonga, New Zealand Ministry for Culture and Heritage Te Manatu. "National Party – Te Ara Encyclopedia of New Zealand". teara.govt.nz. ^ Sparkes, A. W. (2002). Talking Politics: A Wordbook. Taylor & Francis. ISBN 978-0-203-02211-5.